The photos are usually the first thing I notice at websites, and the one featured at and this one is great. A pretty girl holding a diploma is enough to get me hooked. As I strolled down the homepage, my positive impressions faded away. First of all, essay writing services are not mentioned in that flashy menu that consumes the entire page, but I could see that academic essays were mentioned as a category in the main menu of the website. I needed a journalistic article on a random topic for my elective course, and I had already written the piece so I just needed a professional editing service. Let me tell you: the prices at this website are outrageous! However, I had some extra money and decided to spend it in order to get a polished-out paper by the deadline. 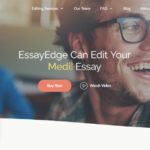 At first, I thought this was a custom-writing service, but it’s really only an editing service that has hired professional editors and proofreaders in its team. They edit academic papers, admission essays, personal statements, letters of recommendation, scholarship essays, and so on. Oh boy, this one is expensive! Simple proofreading costs between $59 and $139. What? I could get an entire paper written for that amount. The Standard package includes proofreading, constructive critique around the structure of the paper, improved content and tone, and a more compelling and relevant essay as result. That was exactly what I needed, so I went for the price of $139.00 for my article of 500 words and waited for the 48-hour turnaround. I got a coupon that saved me $20, so the final price was reduced to $129.00. Still too expensive for what I got. As a new customer, I had to register before being able to place an order. I submitted my paper, paid for the order and waited for clean, properly formatted content to arrive. There was nothing complicated about the process. Unless you pay additional $59 for 24-hour delivery, your order will be ready within 48 hours. That’s a long deadline for a simple editing service. I mean, I’ve had entire papers written within 6 hours from really effective services. There was nothing close to editing in the document I received. Yes, it was polished up and there were no typos or grammar errors in it, but that was about it. I could have asked my friend to spend half an hour and would’ve gotten the same result. The writer didn’t even bother to format my references properly. The package I chose included “constructive critique around structure”, but I got only one comment by the editor saying: “you can add more information in this part”. Yeah, I needed to pay $129 to hear that! The tone and content in the paper was not improved and I didn’t get a more compelling and relevant essay as a result of this service. In conclusion, EssayEdge.com is an absolute rip-off! I would never go back at the website to get more papers edited.